Working in SEO, I always find myself poring over data and looking for ways to expedite the analysis process. Analyzing data can often be tedious, mind-numbing, and boring work, so anything that can be done to speed up finding that needle in the haystack is almost always a good idea. 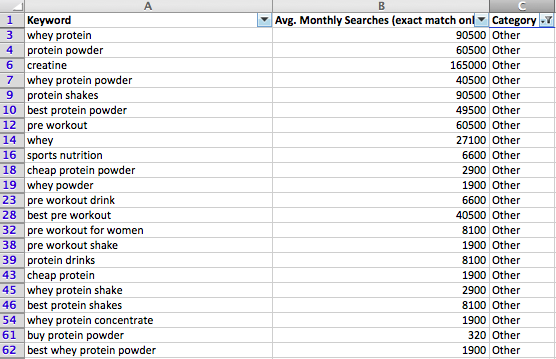 A few months ago, I began using a formula in Excel to categorize data and I’m constantly finding new ways to use it. When I’m doing keyword research for a client and I’m staring down a list (likely thousands of rows long) of potential keywords to analyze and their search volumes, I try to lump similar ones together to see patterns of similarity. At Distilled (we’re hiring, btw! ), I might use a tool like Brightedge or SEMrush to see the queries a website has visibility for. 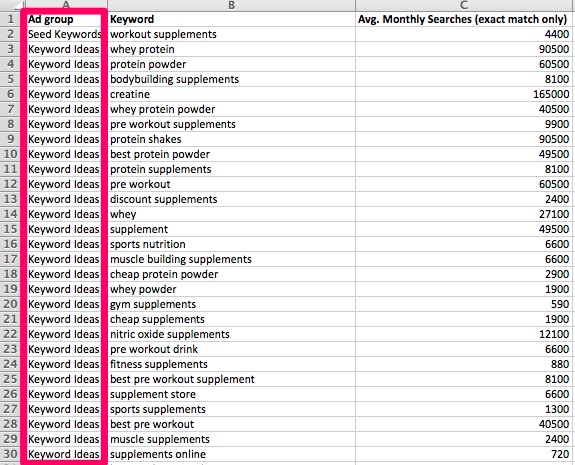 Additionally, I could just put a topic into Google Keyword Planner and receive an output of similar terms per Google. Export your results in a CSV file and you’ll have your starting point for data analysis. You might even wonder how the formula I mentioned before could even be useful because Google Keyword Planner provides an “Ad Group” column, so one should easily be able to know how to divide up the provided keywords. 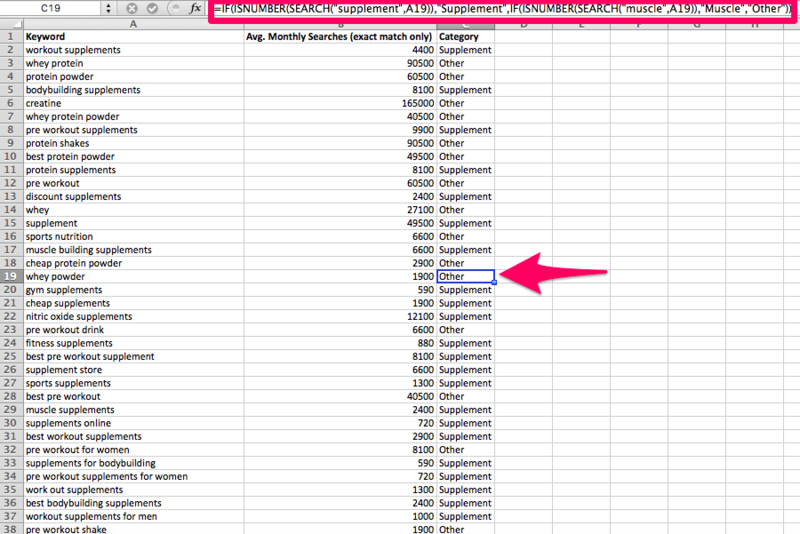 But what if I want to break down this entire list (681 queries, obviously all not shown in the screenshot) to find out how many queries include the word “supplement?” Or perhaps I want to know how many contain “muscle”; I can do that too. Translated, this formula says: Search cell A2 and if “supplement” is found, return the category “Supplement.” If “supplement” is not found, look for “muscle,” and if that is found, return “Muscle” as the category. If neither “supplement” nor “muscle” are found, return “Other” as the category. The real power of this formula is that it can be used across the entire dataset, removing the need for someone to manually go through and categorize each keyword. Double-clicking on the bottom-right corner of cell C2 (where our sheet now says Supplement) will apply the formula to all cells in column C, as long as there’s a value next to it in column B (this is a rule of Excel, not the formula). The screenshot below shows the effects of applying the formula to all of the data. Notice how the formula has changed from analyzing cell A2 to cell A19 within cell C19, where the formula is being applied. Looking at this list, queries containing “protein” seem to be a sizable percentage of the list, so we can add that as a category as well. 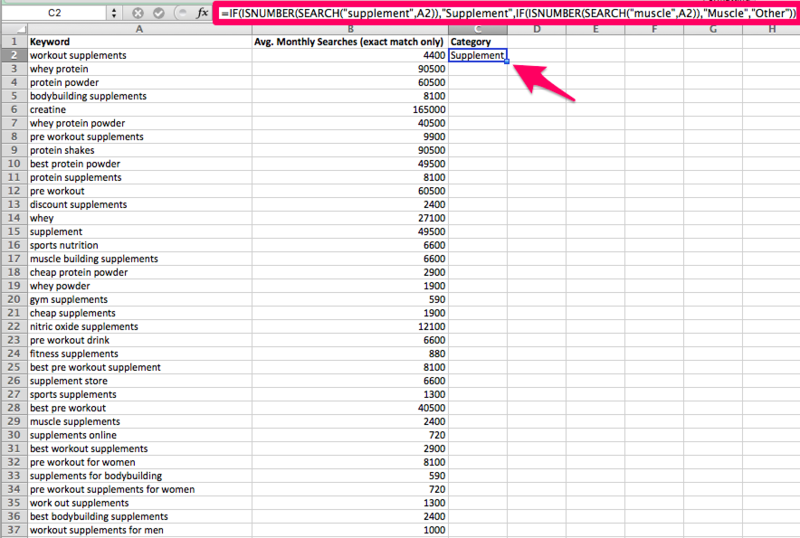 From here we can add in a pivot table and sort by search volume and count of keywords. Click here to learn more about pivot tables. From here we can gain a perspective of where we should be targeting our efforts and where we need to focus more. “Other,” at this point, is still too large a category, so I’d go in and refine it further to create more categories to find out how we can make this even more actionable. Google claims that a new Penguin update is “getting closer and closer,” but the actual release date is still unknown. What is known is that monitoring your backlink profile for spammy and manipulative links is a pretty smart idea. I recommend being proactive and analyzing opportunities to disavow certain links if you think they could be a potential liability. My colleague Sergey Stefoglo recently wrote a piece on how to do a backlink audit in 30 minutes, but if you plan on manually inspecting your referring domains (and you should), this categorization formula can help. Depending on the size of your site, you could potentially be dealing with thousands or millions of linking root domains, so you’d need to start somewhere and cut your list down. One way is to sort the domains by some sort of metric (I often use trust flow from Majestic). I use the formula to look for common words that are associated with spammy domains like “submit,” “seo,” “directory,” “free,” “drugs,” and “articles,” though there are certainly many more (“.xyz” is another I’ve seen frequently). The formula finds any of the specified queries within your list of linking root domains, allowing you to quickly identify those as spam and add them to your disavow list. 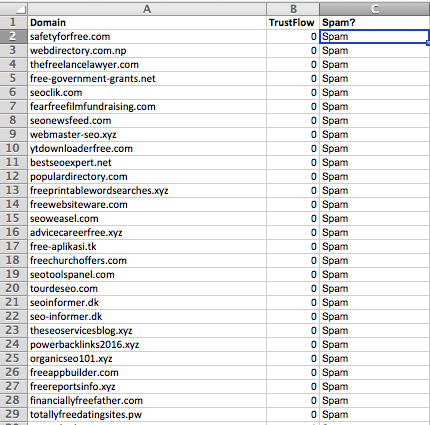 The screenshot below shows a sample site’s link profile sorted by “Spam,” using the filters above as criteria and then by ascending order of trust flow. The formula used in this case is slightly longer than our previous example, but follows the same pattern. Another really cool use case for this categorization formula is data analysis from Google Analytics. For my clients, I’m often analyzing information about traffic to a client’s site from organic channels. I’ll change the displayed number of results from 10 to 2,500 and export the data. Once exported, I may want to know which types of pages tend to get the most traffic, convert at the highest rate, bring in the most money, or the opposite of all of these. As each client’s site is different, you’d be looking for different things on each site. Ideally, the site will have an established subfolder structure like example.com/blog/article-1, example.com/supplements/product-1, or example.com/toys/gadget-1. With these common features in the URLs, you’d be able to label them whatever you’d like, perhaps “blog” or “supplements” or “toys,” and use this categorization to break down what types of pages work best and where can improvement be made. For one client, I exported their data from Google Search Console and broke out their pages by “comparison,” “reviews,” “alternatives,” and “other.” From this, I was able to identify where we could possibly improve, establish what was working, and have more concrete data to show the client.